Pinay WAHM: Bill Gates...Jobless after Today? Yep, that Bill Gates. One of the richest in the world will be jobless by tomorrow. He is spending his last day at Microsoft today. Oh no, another jobless person! I wonder how he will spend his last day at work today. After today, he will focus his full attention to philanthropy. Anyway, I got this email from a friend yesterday. I also got this a long time but I think it's good time to post it now being today is his last day at 'work'. According to the email, he gave a speech at a high school and enumerated his: Gates' 11 Rules. This is a good eye-opener Mommy Juls. Thanks for posting. Bill Gates still making a lot of money. I don't think he needs to work for the rest of his life. Nice ha? really?? i guess he has enough money to live life more without working. Hi there! 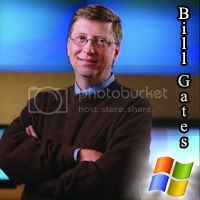 I had no idea about Bill Gates! Wow, jobless, but I think he's set for life and then some. haha Thanks for checking in with me. Since I found your blog I checked out pyzam.com for a new blog template. I changed my template last night and then lost my Link2List (widget)! Aaagghh! What in the world is a widget? Good thing I didn't have very many links to add back since I'm a newbie. So it didn't take too long. dagdag na naman sya sa mga umemployed. LOL. that's good for him. he is getting any younger, may life kaya sya noong sa microsoft pa sya? go bill, enjoy life! magandang gabi sa'yo mommy J.
i'm way here na talaga... sa wakas..musta na po kayo? Rule 11 is so true!